Hi and Happy New Year for 2017. I've been a little quiet on my blog this last month, as I've been enjoying some family time, a little interstate travel, Christmas and New Year. 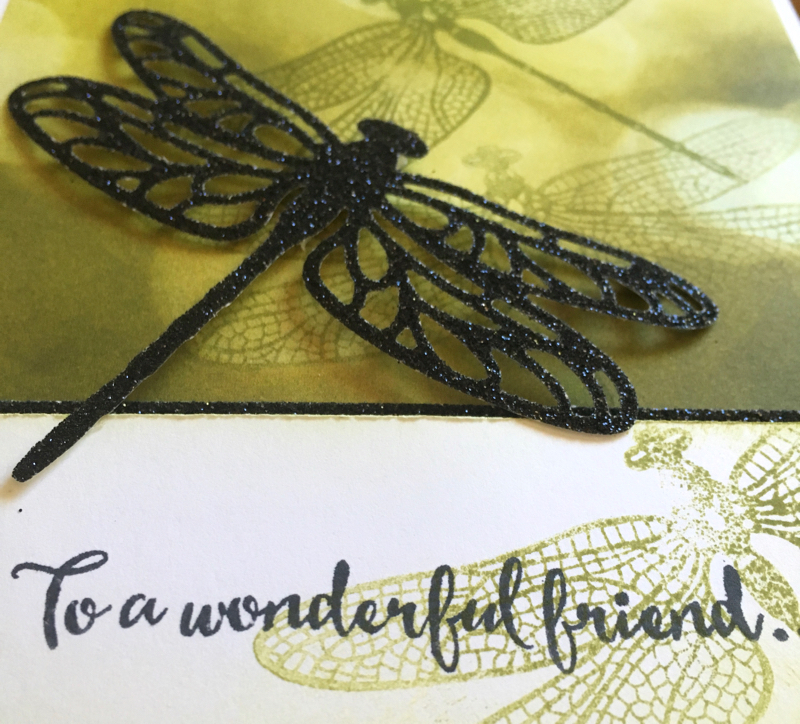 Now, however it is time to wow you all with some samples from the new Stampin' Up! Occasions Catalogue that will be on sale from January 4th. If you would like a catalogue please request one from my Demonstrator website fill in your request in the contact form and I'll send it to you. Dragonfly Bundle number is 144728. I combined stamping, die cutting and Designer Series paper together for this card. One of my favourite Designer Series Papers is the Serene Scenery 15.2 cm square Paper Stack. In this card I used the bokeh image as the main background to my card. I stamped the Dragonfly in Old Olive and then stamped it off to produce a lighter image. Don't you just love the delicate lines in this stamped image? 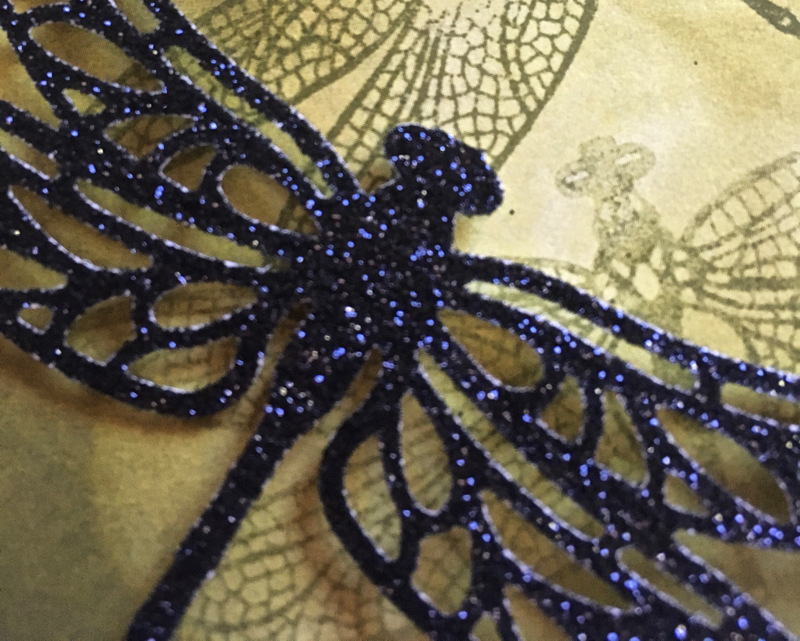 I cut the Black dragonfly from Black Glimmer Paper. You can see how it shimmers in the detail photo below. This particular card is a Pop Up Twist Card with a base of Thick Whisper White. 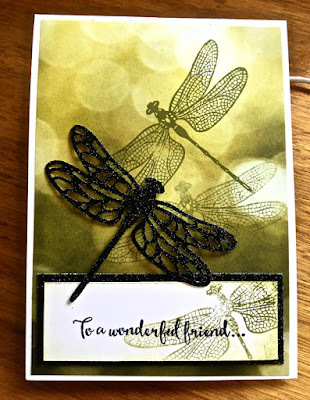 I hope you like my first sample from the new Stampin' Up! Occasions Catalogue. Pop back often to see more samples. You are going to love this catalogue - it is so diverse and so gorgeous. With the launch of the new Occasions Catalogue you will find lots of items to go on your Wish Lists. Sale A Bration goes hand in hand with this catalogue (and don't forget the Annual Catalogue) and you will once again be able to earn FREE Stampin' Up! items with every $90 you spend.